A long-life, 3.4% buffered glutaraldehyde that can be used and reused at full strength for up to 28 days. It is the extra-strength solution for the sterilization and disinfection of immersible medical and dental instruments. 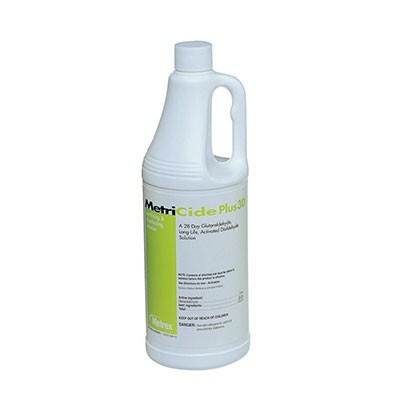 MetriCide Plus 30 is intended for use in a tray system with a variety of noncritical, semi-critical, and critical devices – including anesthesia equipment, respiratory therapy equipment, metallic equipment or instruments, rubber objects, plastic objects, and thermometers. 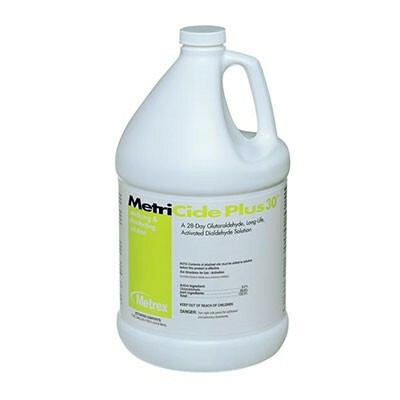 MetriCide Plus 30 may be reused up to 28 days, assuming the minimum effective concentration of glutaraldehyde, as measured by a chemical indicator, remains within acceptable parameters and other conditions of use are met. MetriTest™ 1.8% Test Strips are a glutaraldehyde concentration monitor for use in glutaraldehyde-containing germicide solutions with a minimum effective concentration (MEC) of 1.8% glutaraldehyde. It is recommended to test the glutaraldehyde solution prior to each use to help prevent healthcare-acquired infections (HAIs).